White and wood: a lovely pairing that brings the beauty of nature onto a simple white canvas. This neutral, laid-back combination often takes on a chic Scandinavian character, adding a lighthearted and fresh feeling to a space. The wood contributes a rustic tone, while the colour white adds a clean modern feel. Here are 7 rooms styled by the talented interior designers of homify which take advantage of this simple, timeless, and sensory pairing – if you're looking for interior decor ideas for your home in the New Year, consider freshening up your space with these schemes! The white of this living room is pure and sincere, a monotone theme that covers the sofa, walls, door frames, ceiling, linens, and ceiling light. This effortless, chic white is juxtaposed against the raw surfaces and organic feel of the criss-crossed wooden partition wall, which serves to visually define the living room space without obstructing sunlight from reaching the far end of this elongated room. 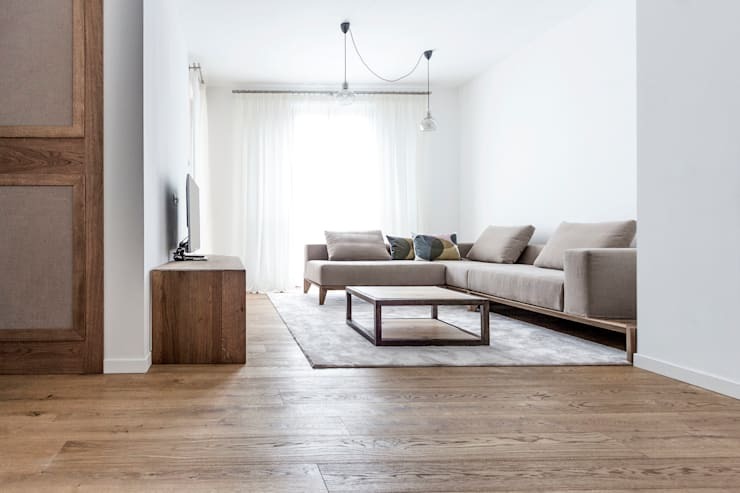 In this design, wood is showcased in its most natural form, complete with knots and bumps that bring greater depth to this otherwise crisp and clean living space. This is an example of Scandinavian decor at its most minimal – the neutral tones are there, along with lightweight furniture and a soft colour palette, but this Scandinavian theme borders on minimalism due to the limited furniture and frills-free design. Against the soft neutral upholstery and rug, the grain in the wooden floor, door, and cabinet stand out, shining a light on the intricacy and texture that can be found in a wood with a greater amount of distinction in its grain. Unlike the cramped crawl spaces of many homes, this attic breathes deeply, bathes in sunlight, and enjoys a spacious, fresh interior. This room enjoys a strong sense of grounding with a smooth area rug, low-profile furniture, and solid tree trunks bringing a calming weight to the space. Light colours are the protagonist of this room's design, turning an aged, rustic theme into a lofty, sophisticated design. This cozy home is situated in the Aosta province of Italy in a small mountain village. 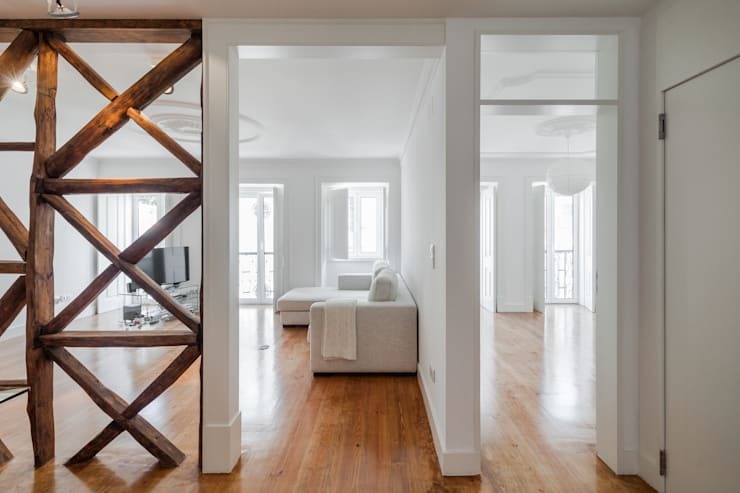 The home is the result of a renovation project that was intended to preserve the traditional character of the building while adding more modern and sophisticated elements. This white-on-wood theme is more wood than white, with the white sofa and fireplace adding a burst of crisp brightness to the otherwise muted and soft look of the room's decor. 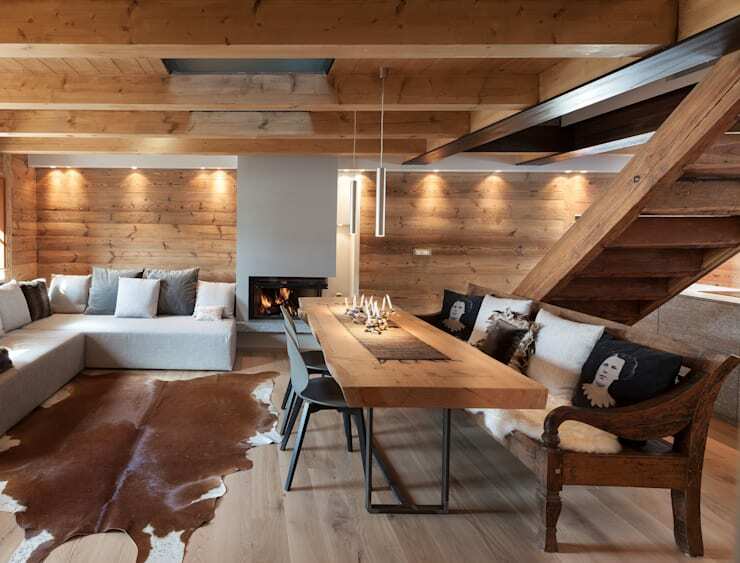 The various large elements of this scheme strike a lovely balance, with the sofa, cowhide rug, table, and fireplace each occupying a distinct space. 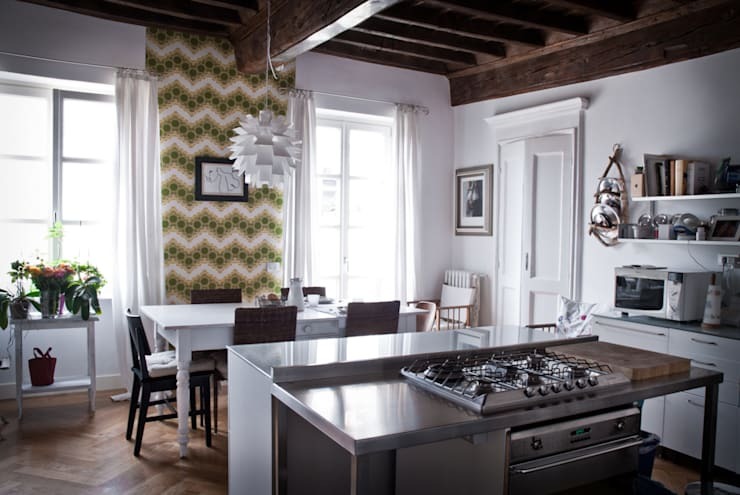 This vintage apartment is located in Turin and recently underwent an interior renovation. The original parquet floor and wooden ceiling have been preserved, while the kitchen and dining room have been given a breath of fresh air with sleek white furniture. Walking the line between vintage and modern, this apartment uses the traditional element of wood and the modern flair of a fresh coat of white paint to create a highly unique character that draws inspiration from many styles. This room is a blank canvas filled with artistic details, all with a unique story. 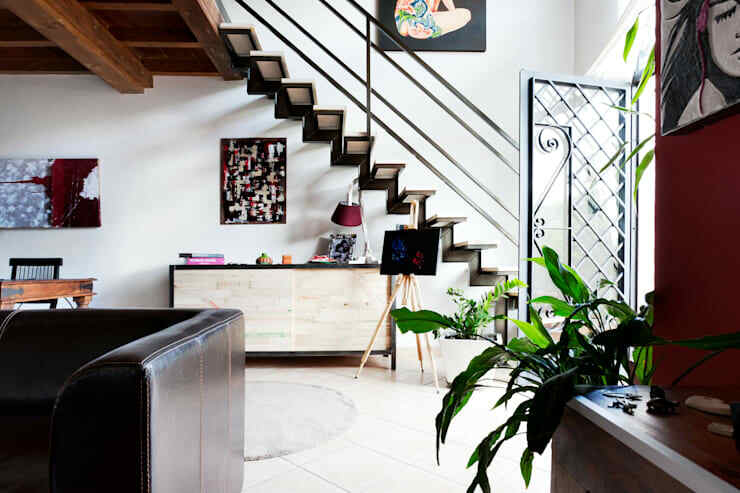 The imposing glass and wrought iron doors filter natural light into the environment, and a metallic industrial style staircase gives the space an urban edge. Sprinkled between the white floor and walls of this open concept room you find a desk made from recycled wood, as well as an antique table. With artwork in various styles hanging on the walls, this eclectic mix seems to hide a special story behind every feature of the room. This dreamy bedroom displays a creative bed design that functions as a stand-alone elevated platform in the middle of the room. 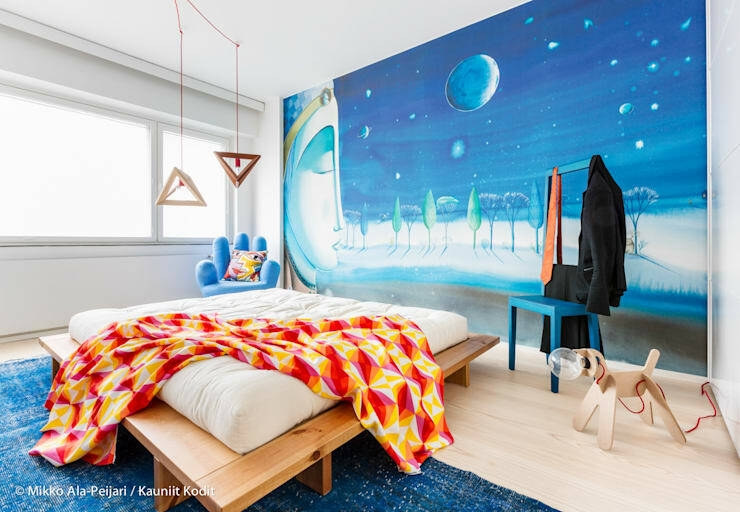 A white mattress placed upon this wooden frame appears as a little island floating in the room – the dreamy atmosphere of this floating island layout is only emphasized by the mystical wall mural and hanging lamps dangling in the center of the room. A sea of blue dominates the colour scheme throughout the space; when combined with the grounding nature of the natural wooden floors and bed and the purifying sense coming from the fresh white walls, this colour scheme brings imagery of an afternoon sky or foamy beach waves – a soothing image for a relaxing bedroom! What's your take on these modern rustic decor ideas? Comment below!